Both are possible, with nearly the same pattern! It all began with this beautiful color gradient yarn – “Drachenzauber”, hand dyed by Drachenwolle, a lace yarn made of 100% Merino with 500 m/ 100 g and a wonderful shine. Hand dyed as a color gradient with a very new technique that was invented by Drachenwolle – the yarn is NOT knitted up before it is dyed in color gradients, and it has not to be frogged before being knitted. It is hand dyed un-knitted in finest nuances. 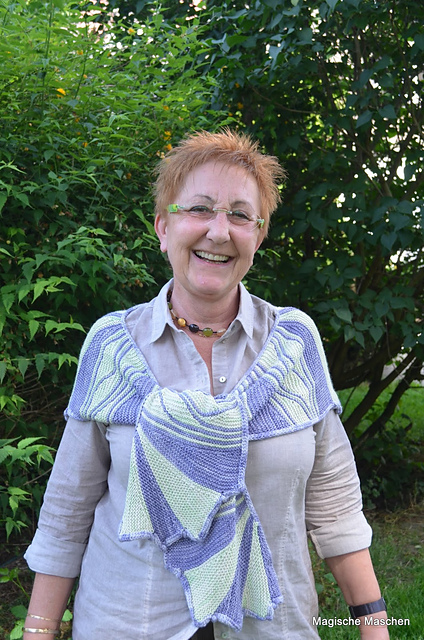 I wanted to design something very special with this yarn – and I hope I have succeeded! 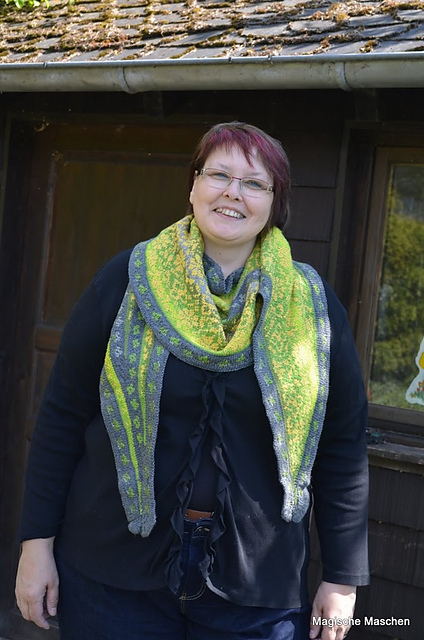 Drachenzauber is designed with elements of Swing-Knitting™ – short rows that build up a harmonic system. 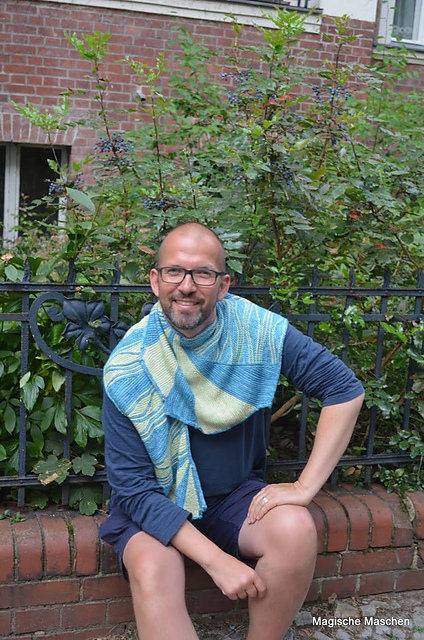 This pattern instruction wants to reach two groups of knitters: those who already have Swing-Knitting™ knowledge, and those who prefer to knit by a row by row explanation. Both types of instructions are included in this one PDF – you need not print everything but only those pages that you need! 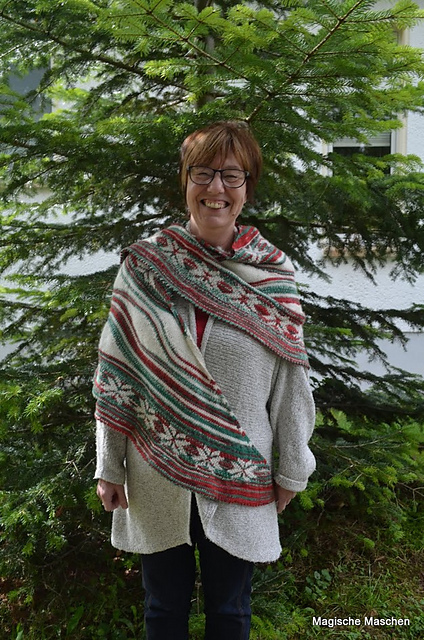 Part A (pages 6 – 15) gives general information about the stole / the shawl and about the techniques that I use – please read it before beginning to knit! Part B (pages 16 – 35) is for those who already know and master the Swing-Knitting™ technique – and if you don’t understand something, you can easily look up at the row by row explanation! 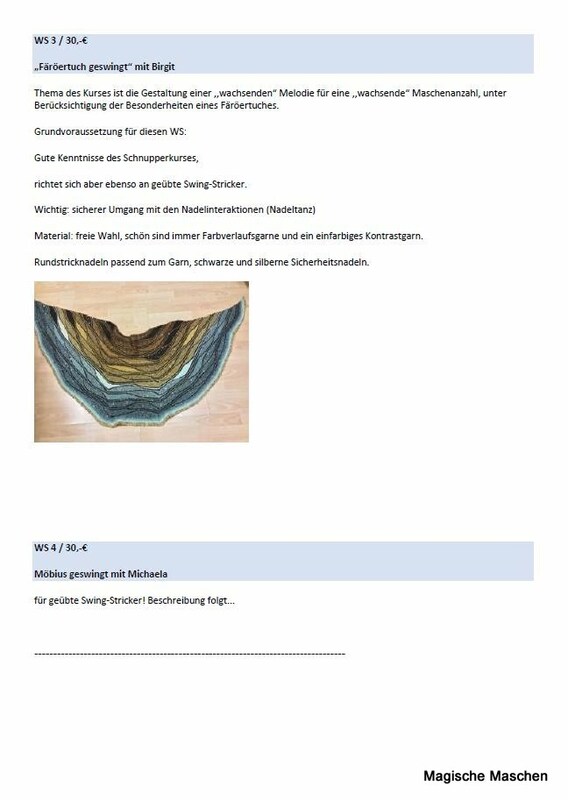 Part B.4. 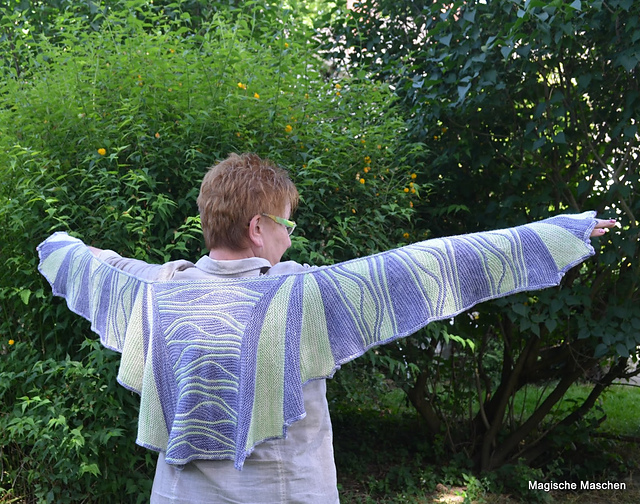 Gives a short summary for the complete shawl / stole for advanced Swing-Knitters. Part C (pages 36 – 69) explains the pattern row by row without further explanations. Part D (pages 70 – 75) explains the sequence of knitting the several parts and how to piece them together – for both groups of knitters. 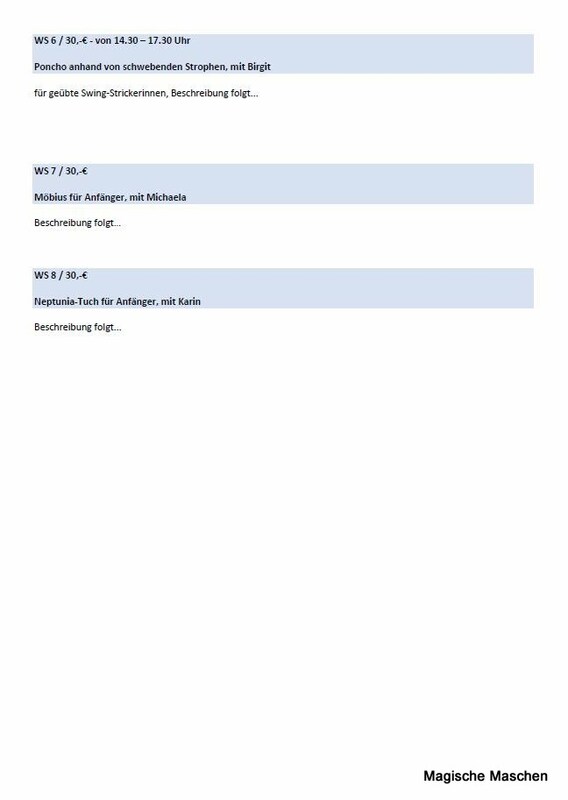 Part E (pages 76 – 91) is the technical appendix. There I explain knitting techniques that not every knitter might know, step by step as photo tutorials. The amount of material that you need refers to the original yarns that I used. If you knit with a bigger yarn (i.e. 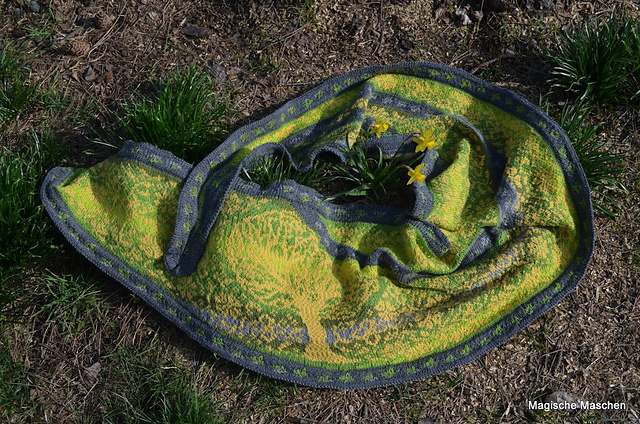 sock yarn), your stole / shawl will become larger and you will need more yarn. If you knit with a more light-weight yarn (i.e. lace yarn with 600m/ 100g), your stole / shawl will become smaller and you will need less yarn. The yarn for stanzas can be every yarn with a VERY LONG color flow – you’ll need 2 or 3 equal balls or skeins. Hand dyed yarns with short color segments are not suited – the eye won’t be able to catch the shapes of the different segments, the fabric will look chaotic. 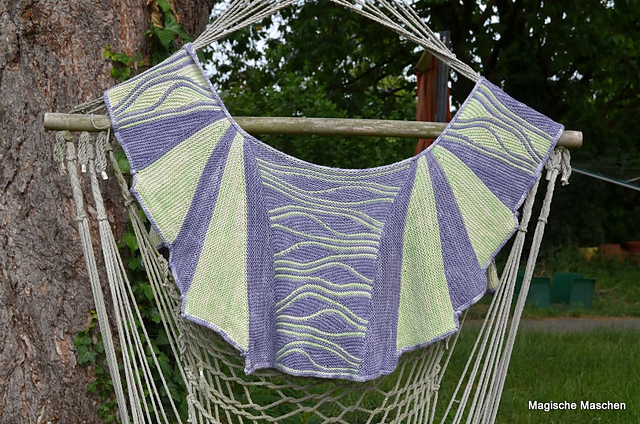 If you want to knit the shawl with 2 balls of yarns for stanzas only, you may knit the sideward trapezes one-colored with the yarn for pauses. 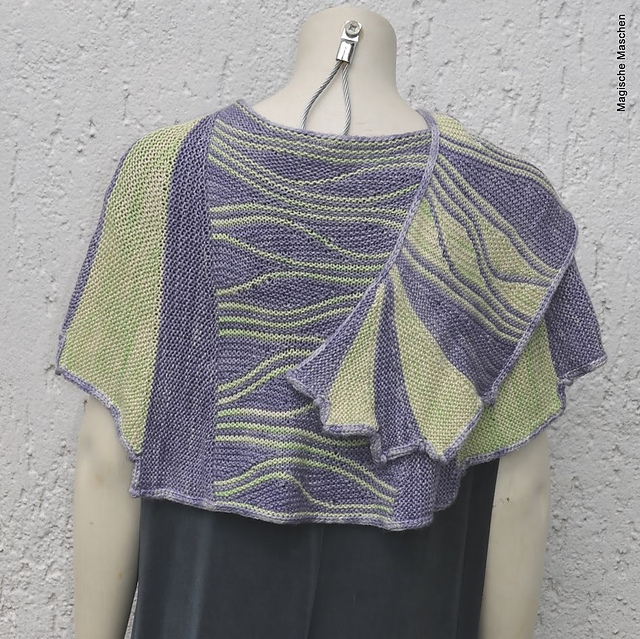 The yarn for pauses should be a solid or semi-solid – if you choose a hand dyed yarn with different color segments and strong contrasts within the skein, you won’t see the graphical structure of the pattern any longer. The eye won’t be able to recognize the shapes. Several additional needles in matching size or smaller, as holders for the single parts: 6/8 x 80 cm long, 3/4 x at least 120 cm long – you can also use a piece of smooth yarn as a holder for the live stitches that are not in use and put these stitches onto circulars later again! 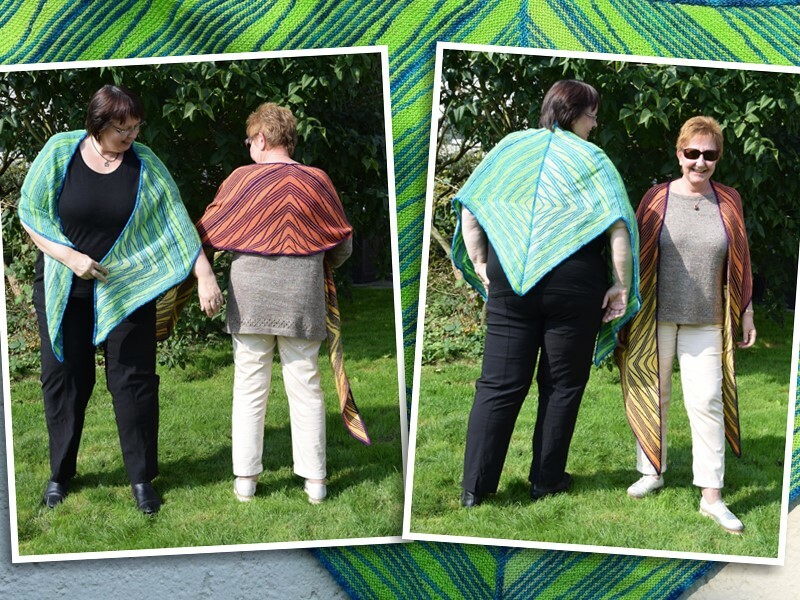 For both pieces the triangular elements are identical – for the stole you’ll knit 3 such elements, for the shawl 4. How to use the color gradients, I’ll explain in “Procedure”. 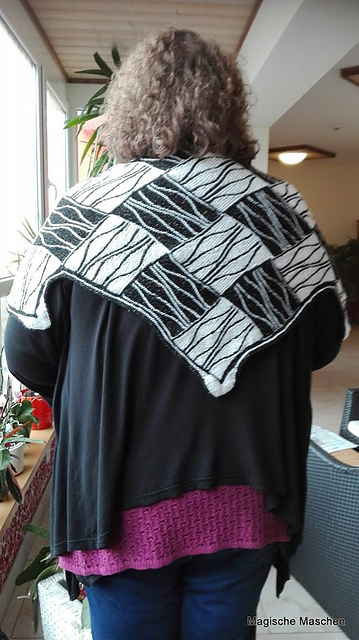 I’ll also explain in detail how to compose the stole / shawl of the single elements. 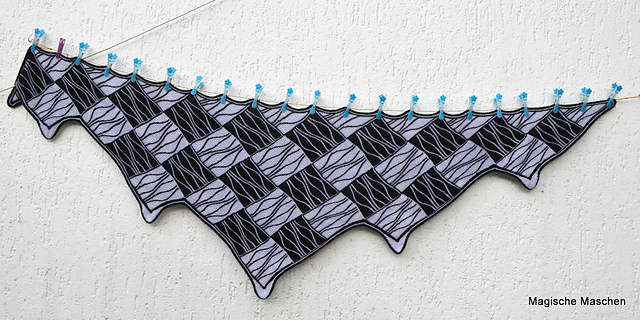 The “inbetween segments” (trapeze shaped segments) of the stole are also worked in Swing-Knitting™. 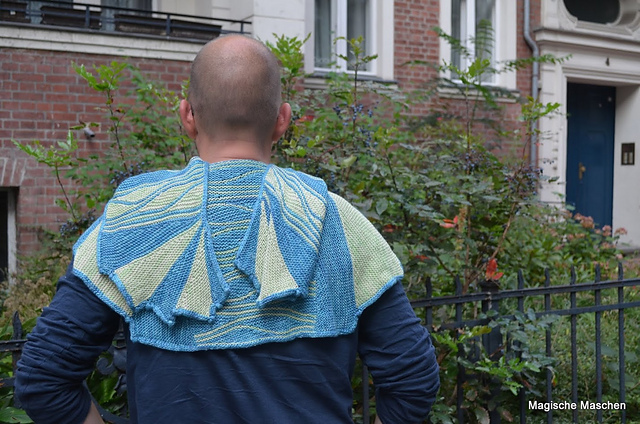 You have 2 possibilities to knit the shawl: If you want to make the trapezes in Swing-Knitting patterning, you’ll need 3 x 100 g Drachenwolle color gradient. 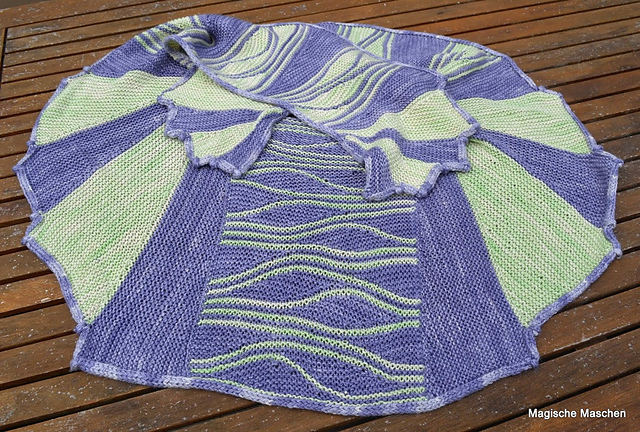 If you want to knit the trapezes in plain garter stitch with the yarn for pauses, you’ll need 2 x 100 g color gradient. 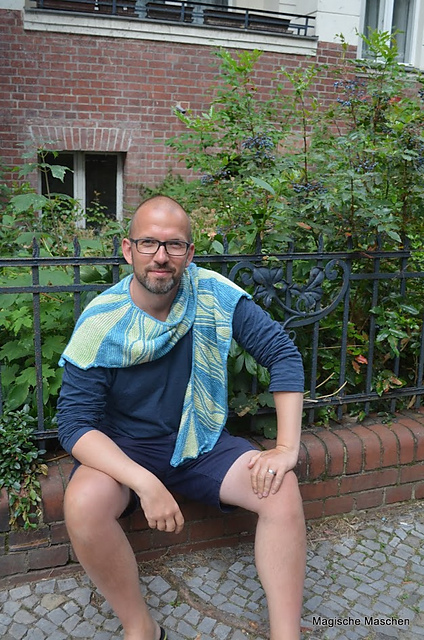 Thank you to my wonderful test knitters Angelika Woolangel und Angelika Rübezahli – they spent a lot of time helping me to find counting mistakes and ambiguous explanations – hopefully there will be no more mistakes in the pattern. And THANK YOU to my lovely models Angelika and Petra! Have a lot of fun knitting Drachenzauber! 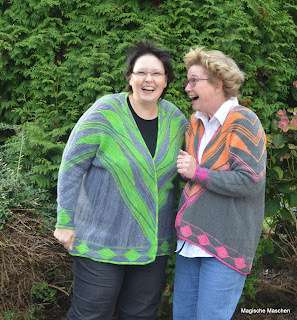 Finally – I just released Tuttifrutti on Ravelry, in German and English! 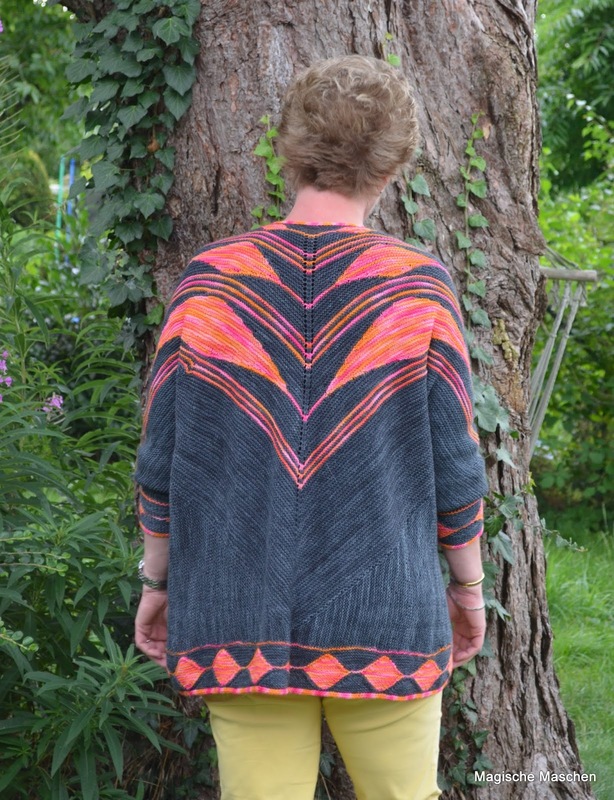 Colorful as a fresh fruit salad, that’s how the patterning of this cardigan appears. 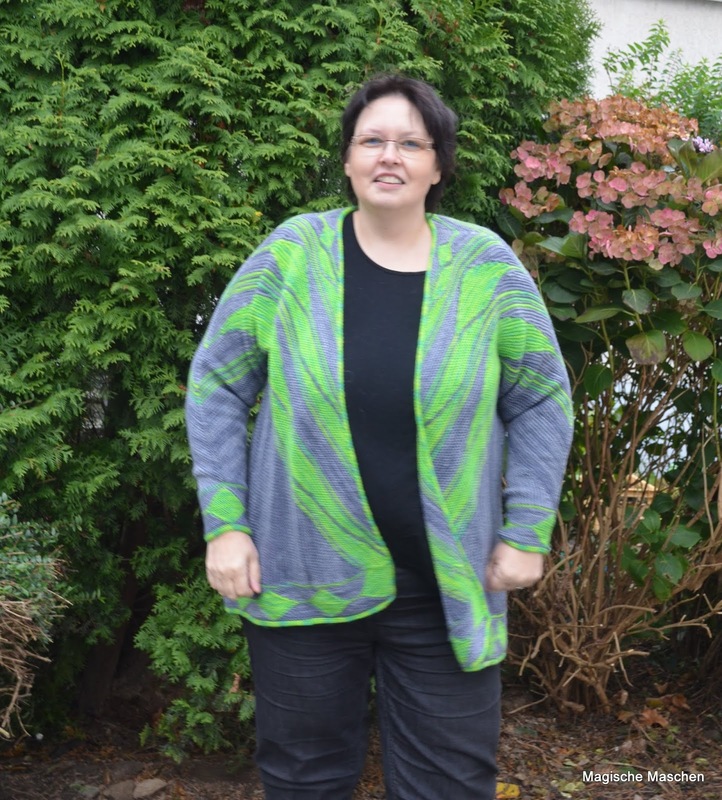 The cardigan has no closures, and its bottom is curved. 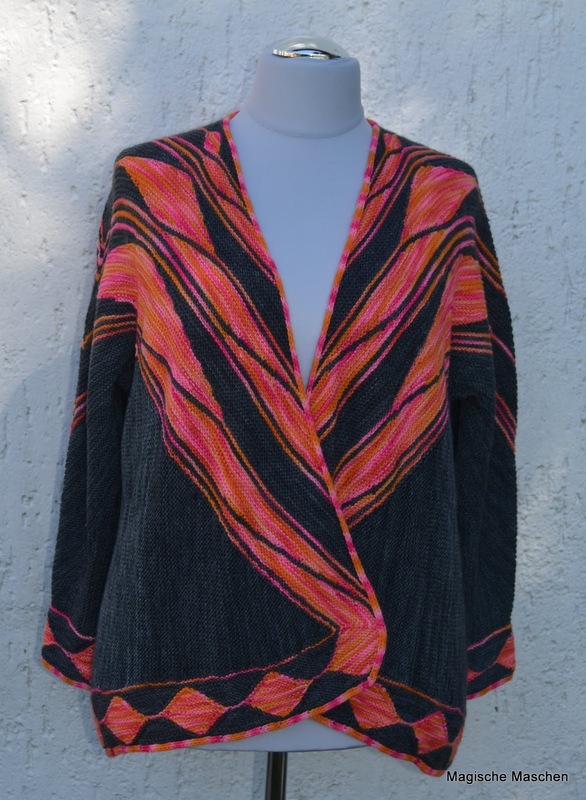 The cardigan is knitted in one piece, without any seams! It is knitted top down. The patterning applies elements of Swing-Knitting. They are explained for Swing-Knitters and row by row. 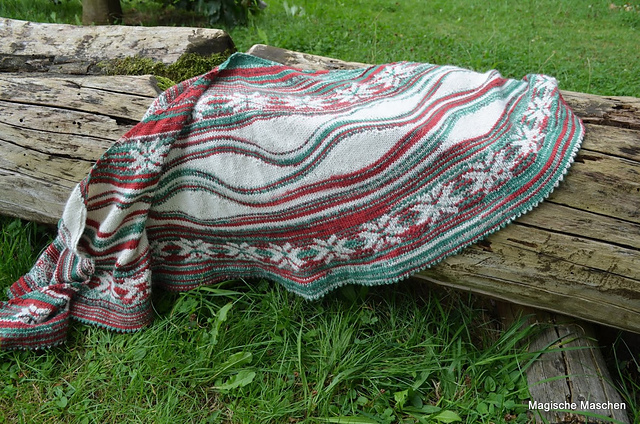 There is only 1 single row purled, and one piece of the sleeve is knitted in garter stitch in rounds. 99% of this cardigan are knit stitches only! 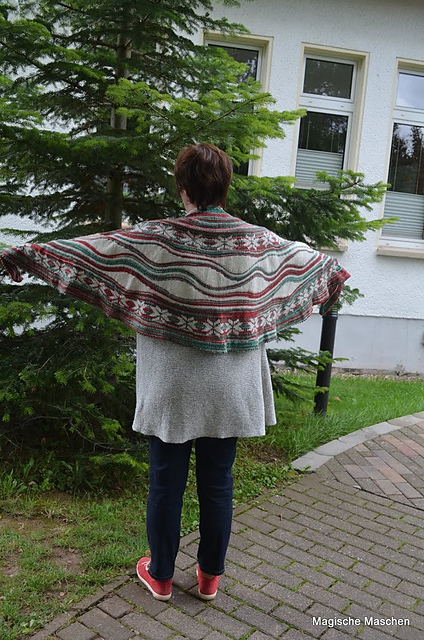 The cardigan is begun like a shawl – and then the parts that are missing to make it a cardigan, are filled in in different knitting directions. I’ll explain the quite complex construction step by step. I’ll describe two different sleeve versions: one version for a narrow and close-fitting sleeve, the other version for a wider sleeve. · Part A (pages 8 to 14) gives all general information about the cardigan, please read it before you begin! 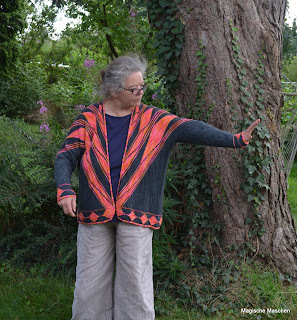 · Part B (pages 15 to 61) explains the complete cardigan for Swing-Knitters™. · Part C (pages 63 to 146) explains the pattern row by row. · Part D (pages 147 to 172) explains all knitting techniques that might not be known by everyone, step by step as photo tutorials. Every segment is explained in detail, for Swing-Knitters™ and in the row-by-row version. Sizes: Depending on your yarn and gauge! 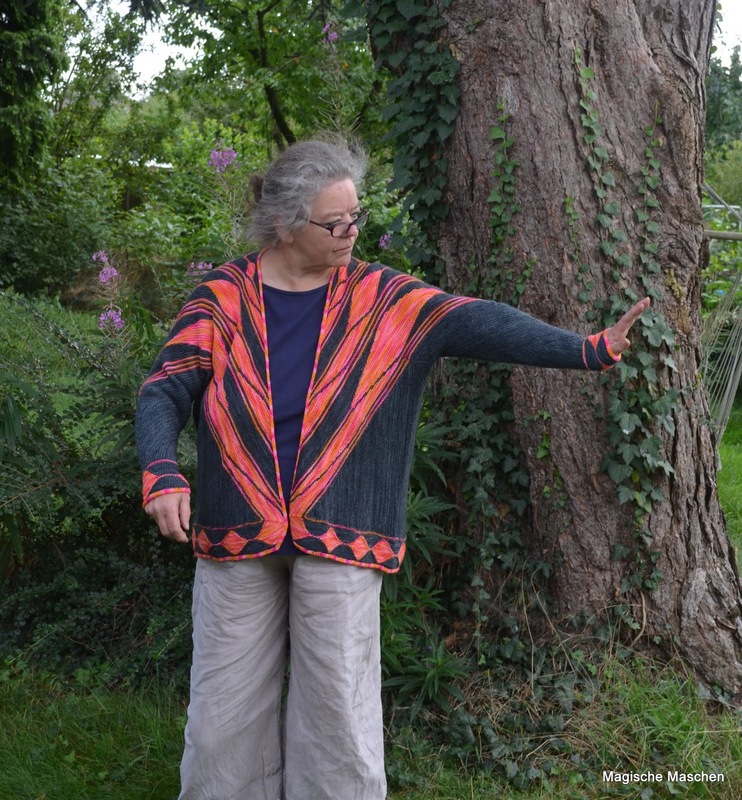 The cardigan is knitted identically for all sizes – the different gauges of different yarn types are used to generate different sizes. I’ll explain this in detail! 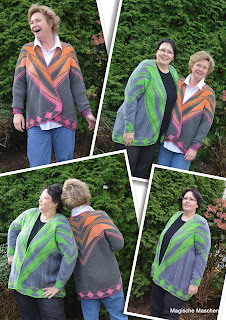 The different sizes with different yarns and how much you’ll need of these yarns is shown in the photos in the Ravelry pattern! The complex construction gives no chance to change stitch numbers for different sizes. I’d have to calculate and knit and write a completely new pattern for every single size. 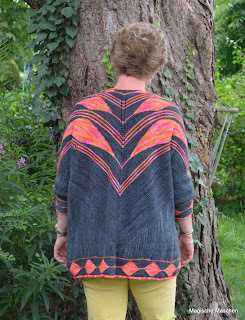 The yarn you choose and the matching gauge decide about the finished size of this cardigan! Therefore, it is ABSOLUTELY NECESSARY to make a proper swatch before you begin! 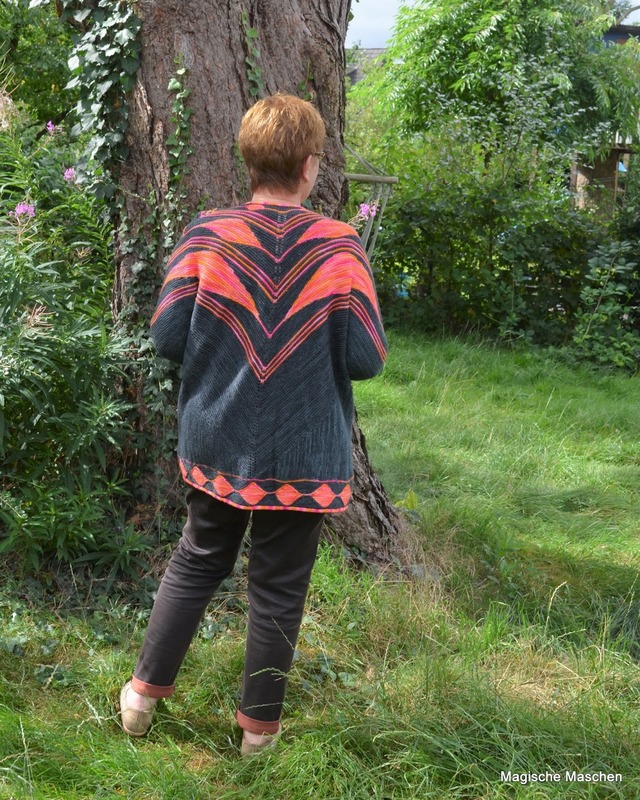 The cardigan will keep its shape very well, due to the appropriate yarn and the different knitting directions. Gauges before and after washing are broadly similar. I urgently advise against choosing a 1ply un-plied yarn! 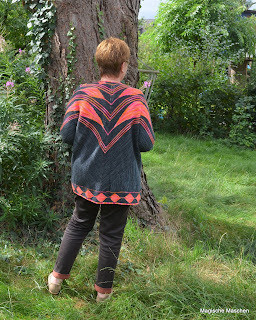 A single yarn tends to get baggy much more than a plied yarn, and it tends to pill a lot more – the stronger the yarn you choose, the longer you will enjoy the finished cardigan! 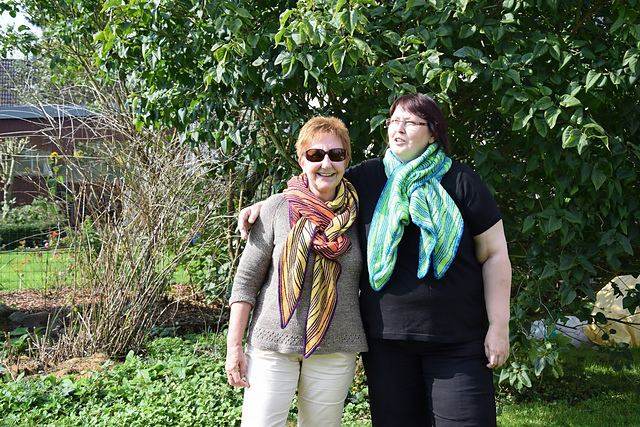 Pure merino wool will “grow” more to length than mix yarns, when you wear it. At least if the garment is not very slim-fitting. Thank you to my Stricktreff ladies for modeling! 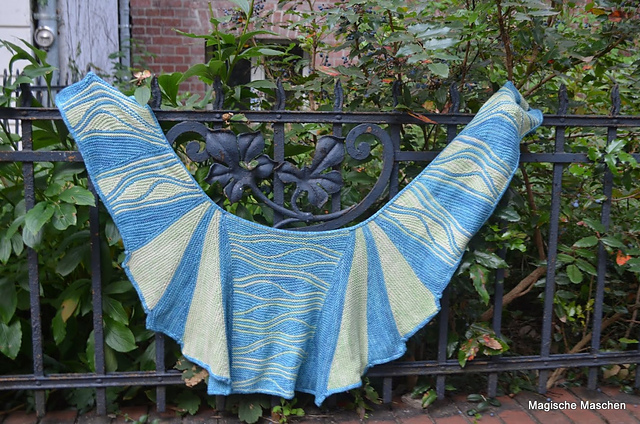 Doe Waka is a shawl for advanced (Swing-) knitters. 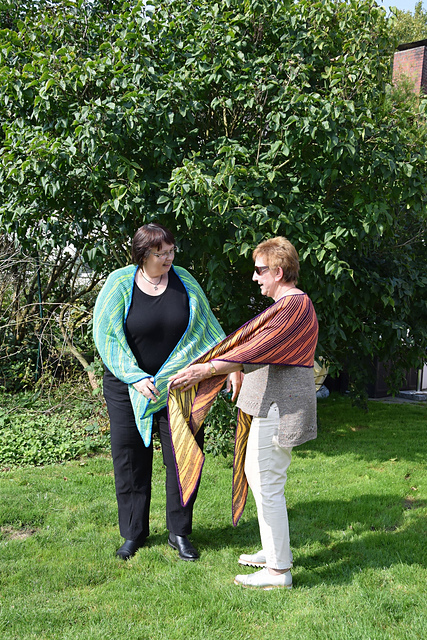 Doe Waka is a long, asymmetrically shaped, crescent shaped shawl. 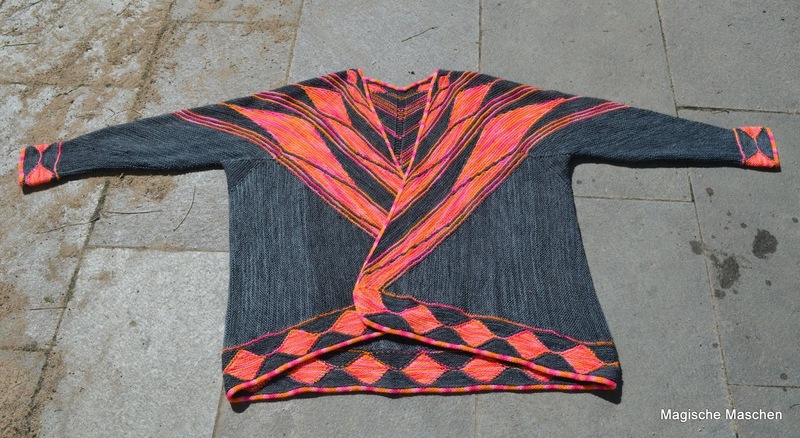 It combines elements of Swing-Knitting™ and Colorwork. 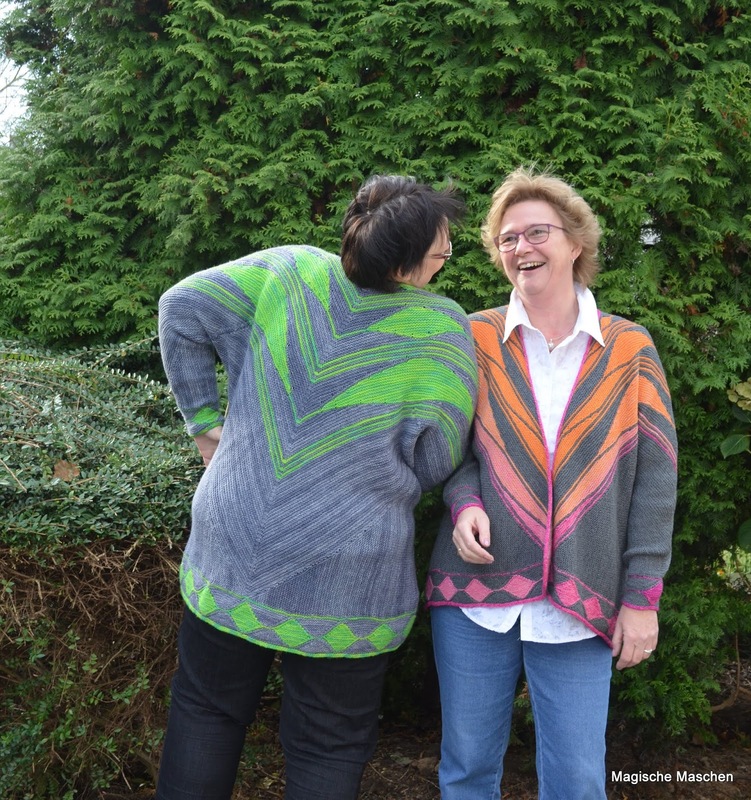 Doe Waka is completely charted, so you can knit it without any prior knowledge of Swing-Knitting® – additional information for Swing-Knitters is added to each segment in a colored box. All techniques that might not be known by everyone, are explained in detailed photo tutorials in a technical appendix. 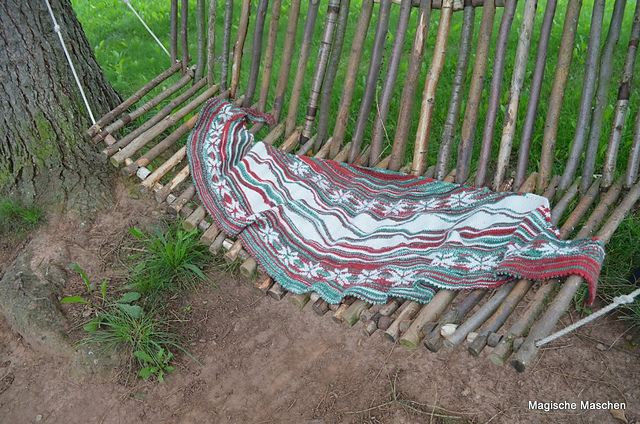 Material: I have knitted Doe Waka with sports weight wool of 320m /100 g and needle size 3.5 mm. 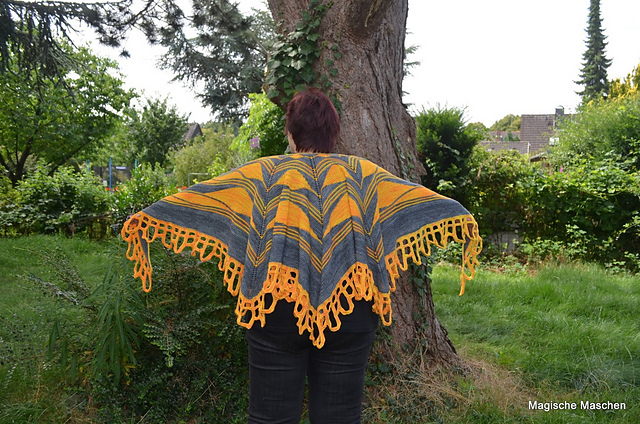 The finished shawl has a weight of 383 g, there will be leftovers of every color. Please take care that the colors you use show enough contrast! Compare the colors of the variegated yarn with the light-colored solid yarn for the stanzas, and compare the variegated yarn and the dark solid for the pauses! 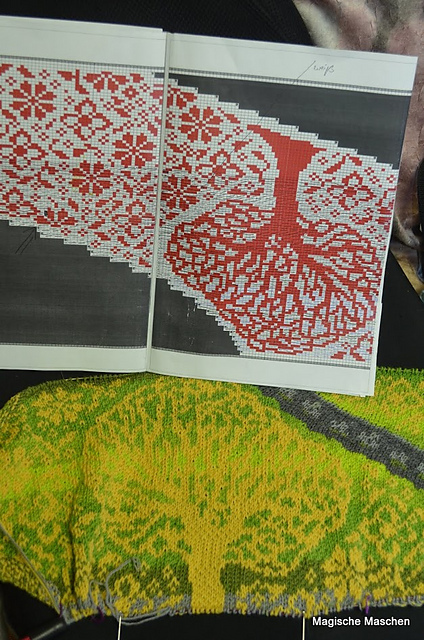 Only if they show enough contrast, you will be able to clearly see the flowers and the tree – I did not succeed to 100% with my Doe Waka color choice ! 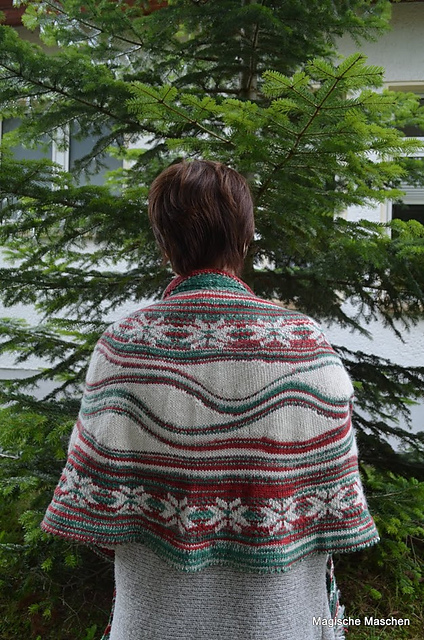 If you knit the shawl with thinner yarn (and smaller needles), it will become smaller. 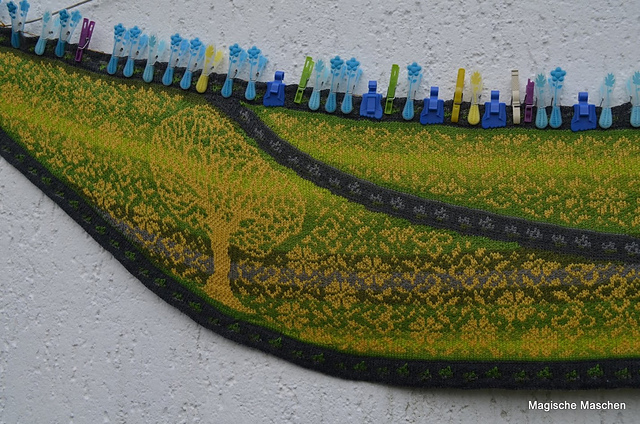 If you knit the shawl with thicker yarn (and larger needles), it will become larger and you’ll need more yarn. Colorwork (working with two colors in one row) – that’s a header for all those techniques that work with two yarns in two colors in one row. 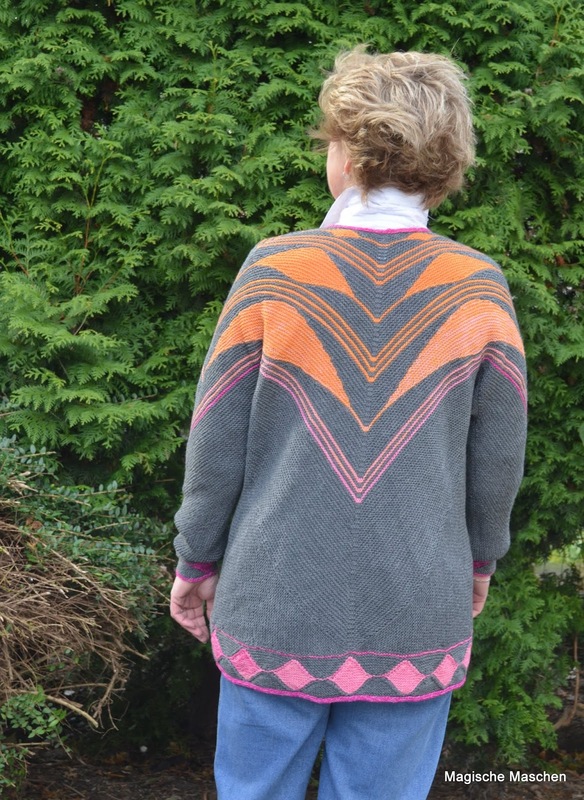 Fair Isle, Norwegian, Islandic patterns and more terms are included in Colorwork – the size of the two-colored patterns and the origins of the charts lead to different names. 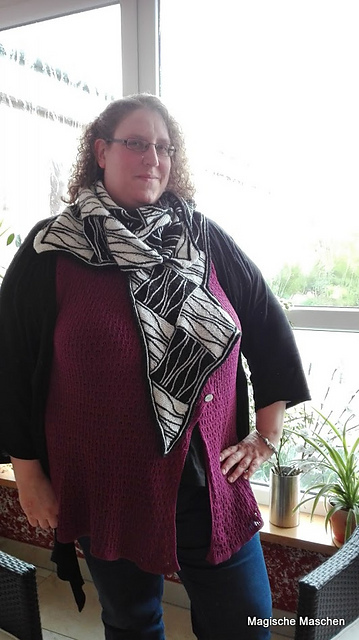 I have drawn the charts for this shawl free, and I only used two traditional flower patterns within. 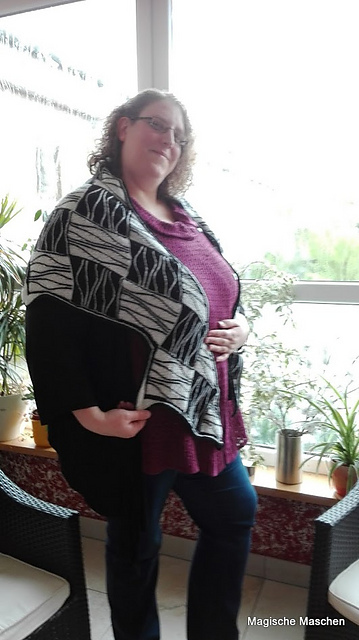 This shawl uses a pattern rapport only within the pauses (the dark areas) above the stanzas (areas built with short rows), the stanzas were drawn free. The shawl combines Colorwork with short rows – therefore you can’t knit the Colorwork traditionally in rounds, it has to be knitted in rows. 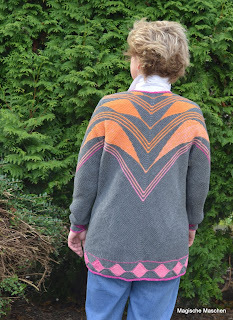 I have added another PDF to this pattern, “How I knit Fair Isle in rows”. 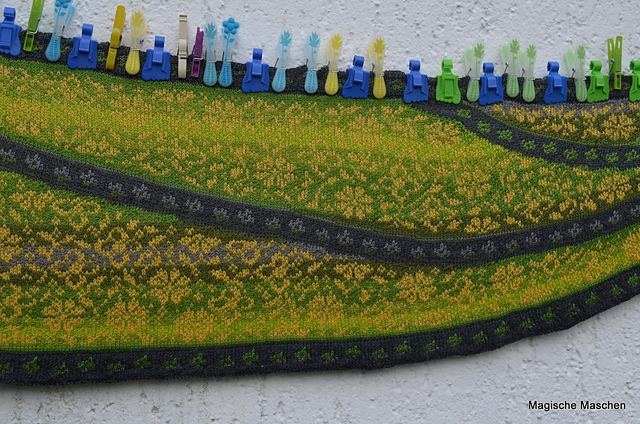 It describes in detail how I knit Fair Isle in rows. Every step includes a written description and a short video. EVERY technique that leads to a similar result, is “correct”!!!!! 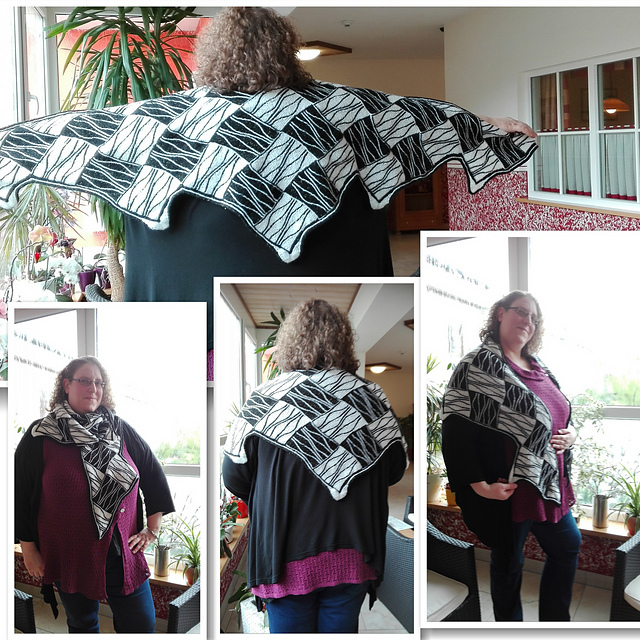 If you feel good having floats on the back side of a shawl – do it! 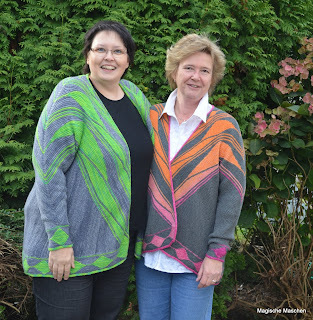 If you lead the two yarns in a different way – do it! The refrain of this canon “Doe Waka“ haunted me until I decided that the shawl had got its name . 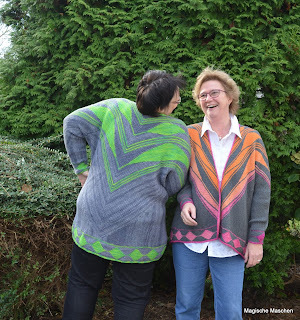 You can ask questions and make remarks in our Ravelry group http://www.ravelry.com/groups/knitting-the-swing—swing-knittingtm – and please show us lots of photos! 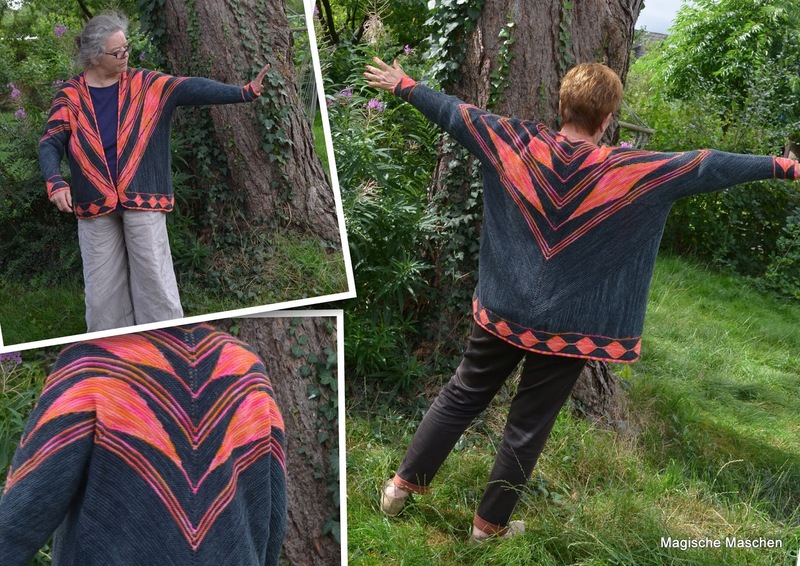 Finally – the Sun Teaser pattern is released! Why did it last so long? 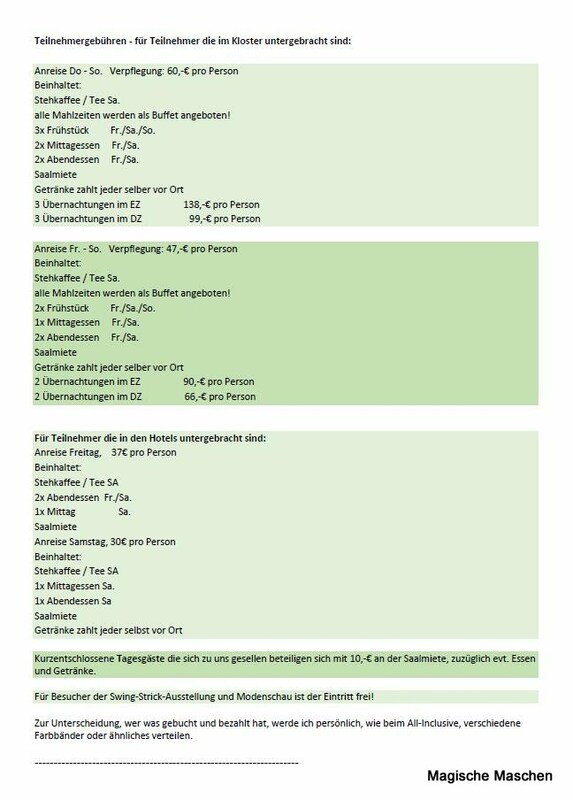 After writing the German version, it was test-knitted for several times, then I made the corrections before starting the translation. 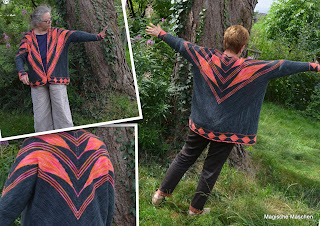 Whatever, now the pattern finally is online :)! Teasing the sun to shine – that’s what I want! 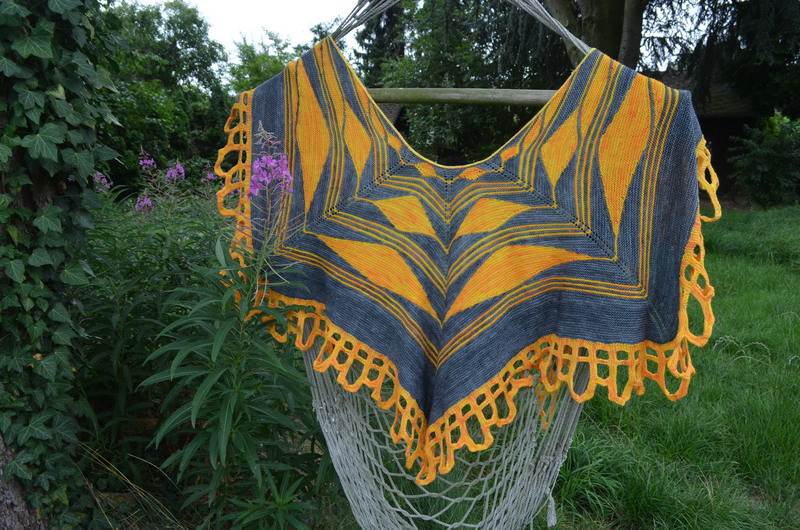 The sunny yellow of this shawl interrupts the rainy gray of summer this year in Germany! 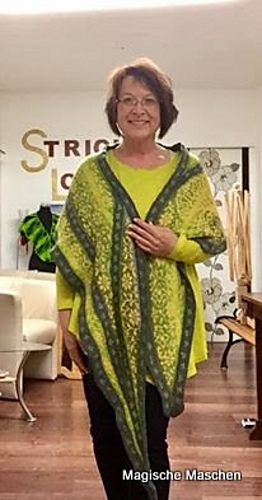 The shawl is knitted top down. The patterning applies elements of Swing-Knitting™. They are explained for Swing-Knitters™ and row by row. The sun rays border is knitted all around the shawl. 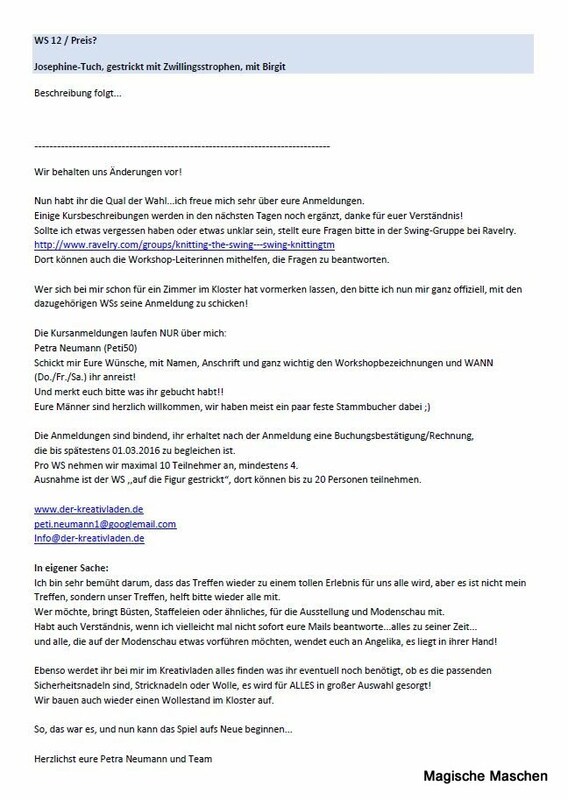 This is quite an effort but worth the time. 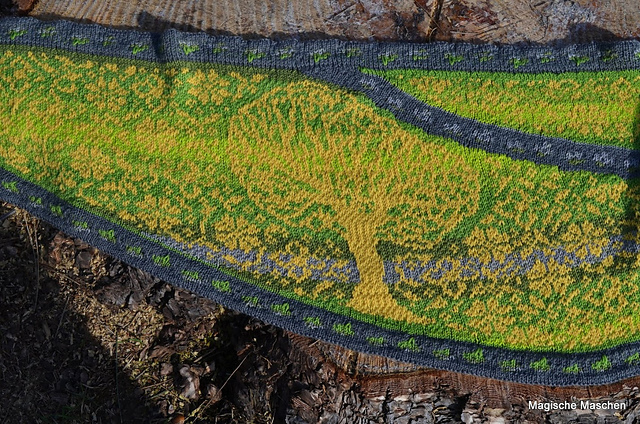 The sun rays border is knitted in “Openwork” technique. It is explained step by step as well. 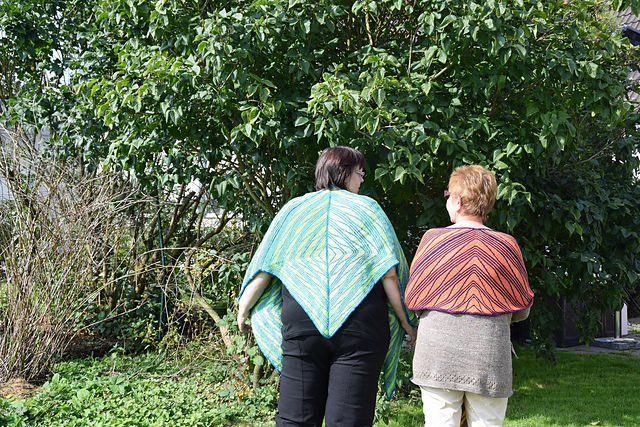 Part A (pages 6 to 8) gives all general information about the shawl – please read it before you begin! Part B (pages 9 to 19) explains the pattern for Swing-Knitter. Part C (pages 20 to 46) explains the pattern row by row. Part D (pages 47 to 70) explains the sun rays border in Openwork technique step by step. General instructions for finishing the shawl are given here as well. Part E (pages 71 to 88) explains all knitting techniques that might not be known by everyone, with step by step photos. 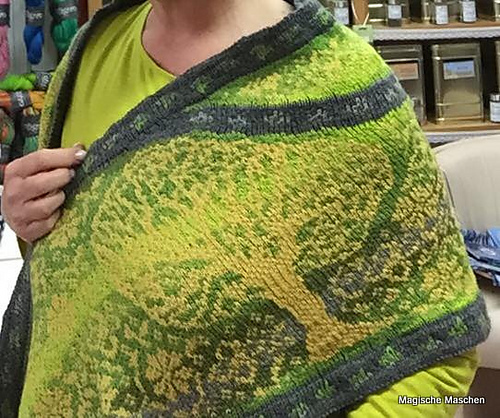 There is not a single purl stitch in this shawl! 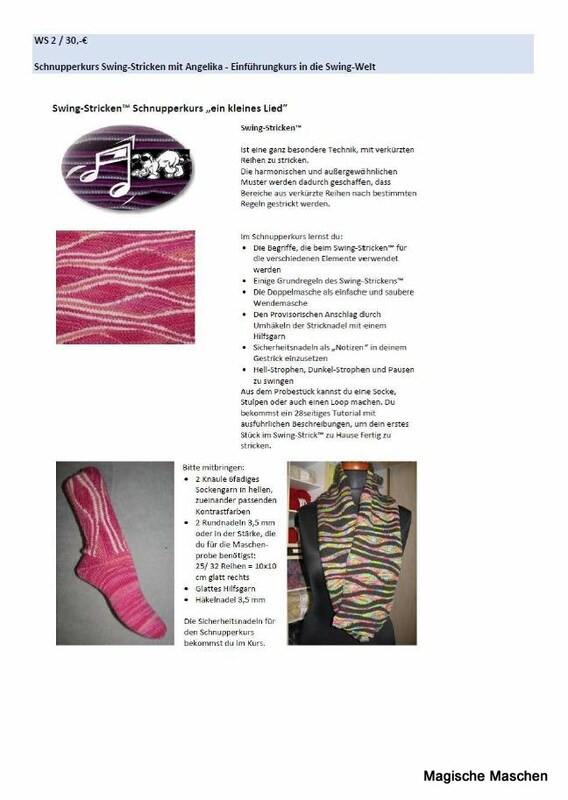 All terms used in Swing-Knitting™ are explained in the technical part! 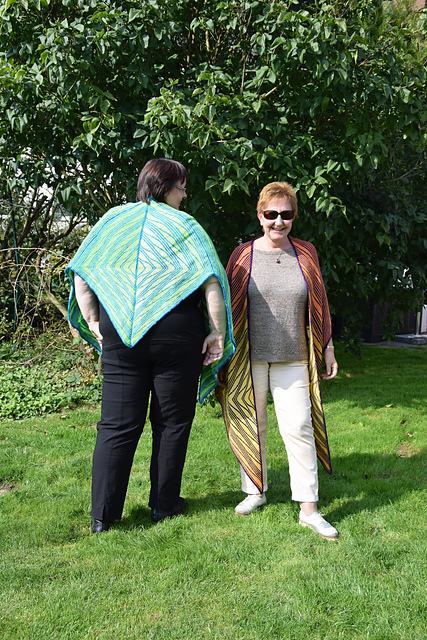 Sun Teaser is a shawl with a kind of cape shape. It is shaped like a triangle on the back, whereas both fronts form a long triangle. 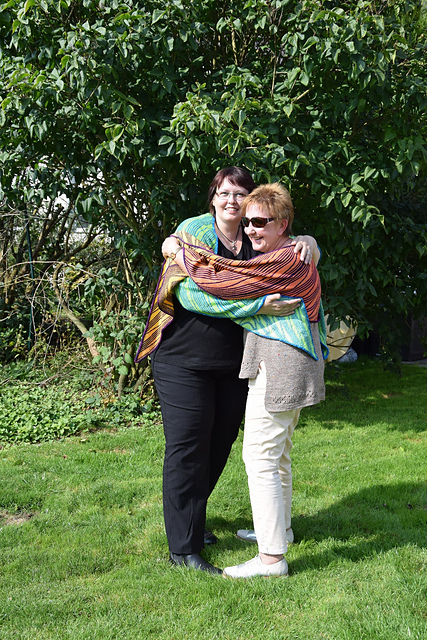 The neckline is shaped – so the shawl will fit your shoulders very well. 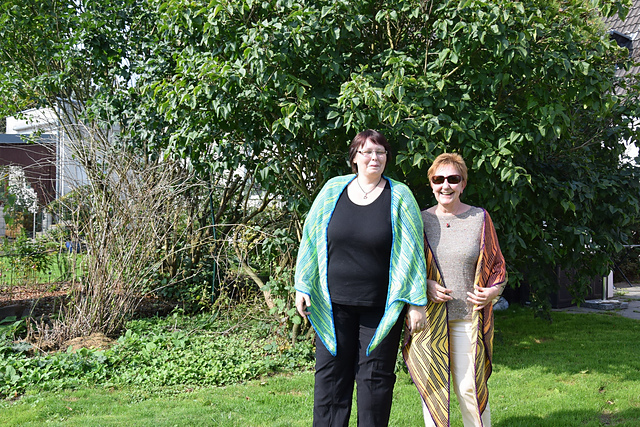 The shawl is knitted top down in one piece. 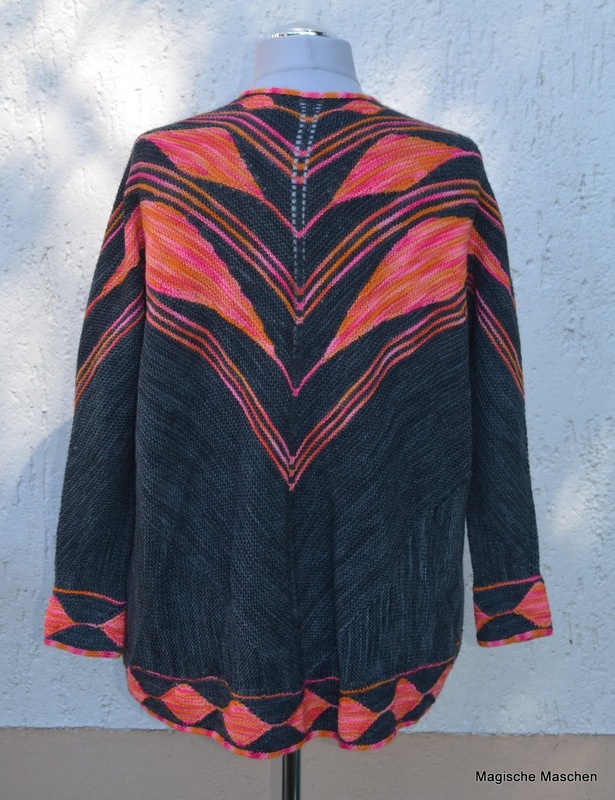 Size: The middle tips on the back and over the shoulders are approx. 68 cm deep, the front tips are approx. 107 cm long. 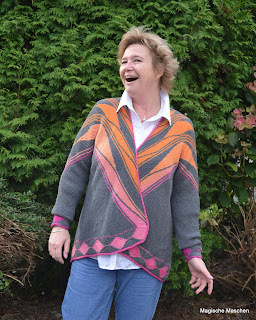 THANK YOU to Petra for modeling, and THANK YOU to my test knitters Petra, Ines, Katharina and Silke! 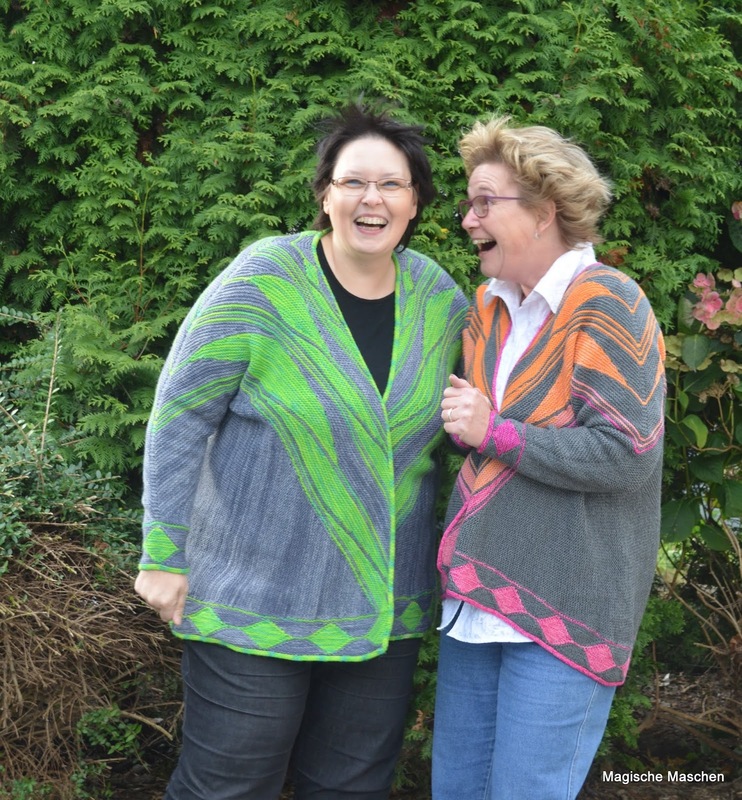 And now have fun knitting the Sune Teaser – I am looking forward to your photos! 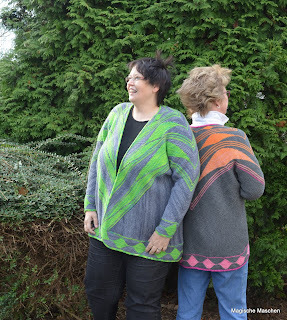 I just released Swingtrelac on Ravelry! 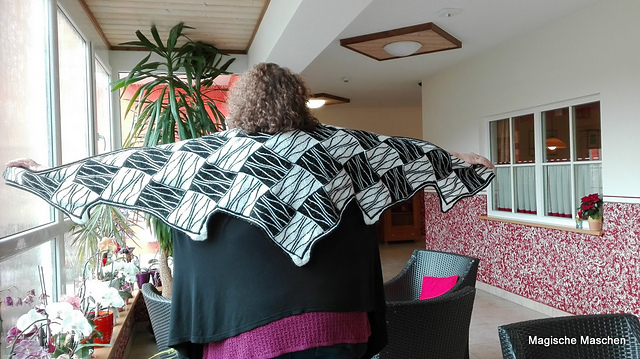 Swingtrelac is a long triangular shawl. 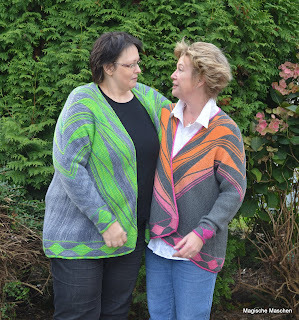 It is completely composed of Swing-Knitting™ elements – those are explained row by row and for Swing-Knitters. 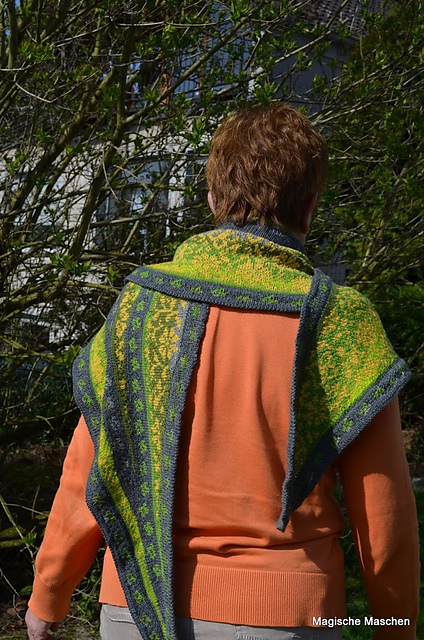 There are additional Swing elements in the border around the shawl. 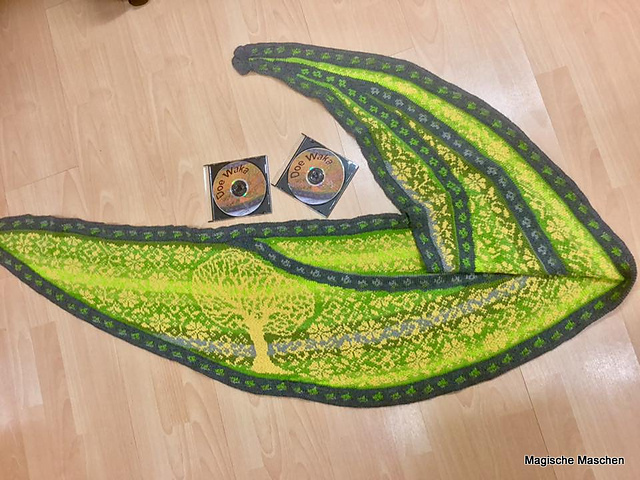 The shawl is approx. 230 cm wide and 65 cm deep in the middle tip. The size can be easily adapted by adding or omitting complete Entrelac rows. For Swingtrelac, you use 4ply sock yarn. The 2 colors should strongly contrast. You know Entrelac – the wonderful pattern of interwoven segments composed of little squares that either lean to the right or to the left side. 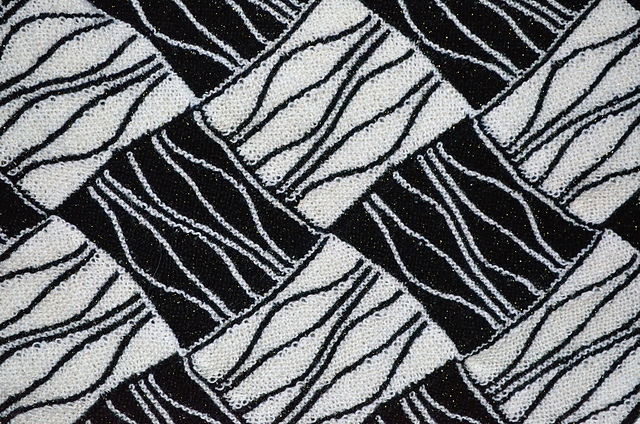 Swingtrelac is the adaptation of Entrelac to Swing-Knitting™ – the squares that are interwoven are not small but large squares patterned in the Swing-Knitting™ technique. 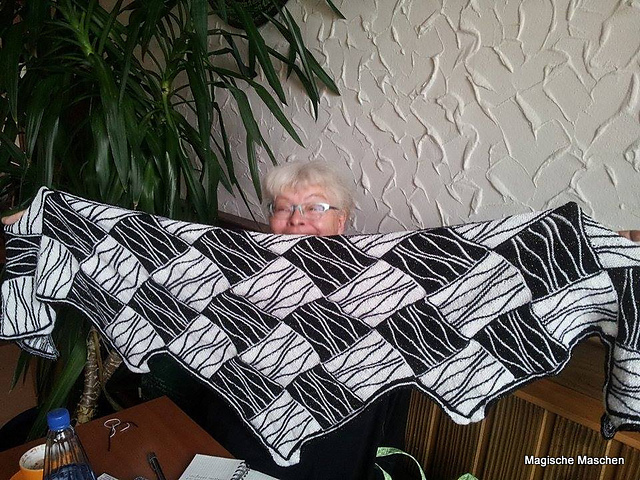 • Every square is composed identically, every square is 33 stitches wide and 33 double rows high. 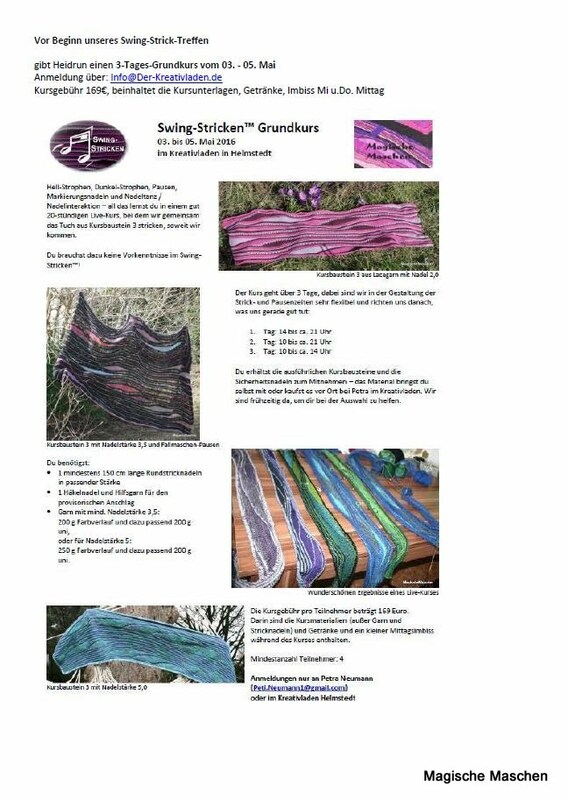 The Swing-Knitting pattern on each square is a calculated one, no free Swing-Knitting. It consists of light stanzas only. 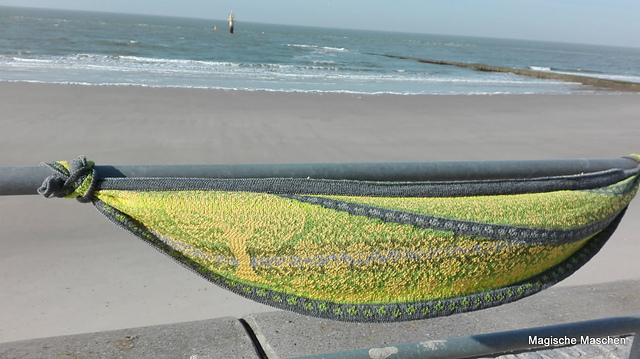 Stanzas and pauses are knitted in garter stitch with contrasting yarns (the specific Swing-Knitting terms are explained in detail in the technical part). 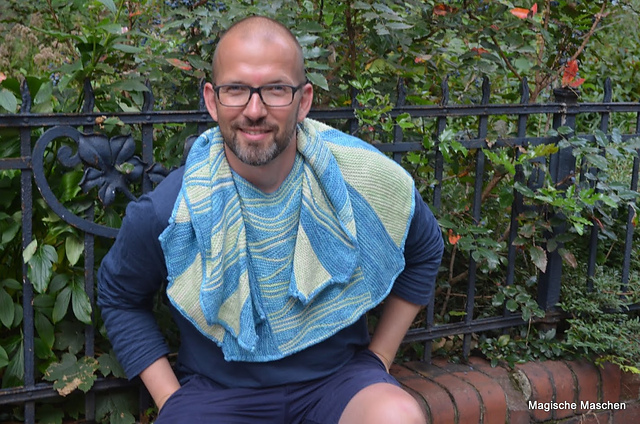 • As it is done in “true Entrelac”, the left-leaning squares are knitted on the right side of the fabric in garter stitch, the right-leaning squares are knitted on the wrong side of the fabric in reverse garter stitch. • Part A (pages 8 to 55) explains the pattern for Swing-Knitters™. • Part B (pages 56 to 98) explains the pattern row by row. • Part C (pages 99 to 108) explains all knitting techniques that might not be known by everyone, step by step as photo series. 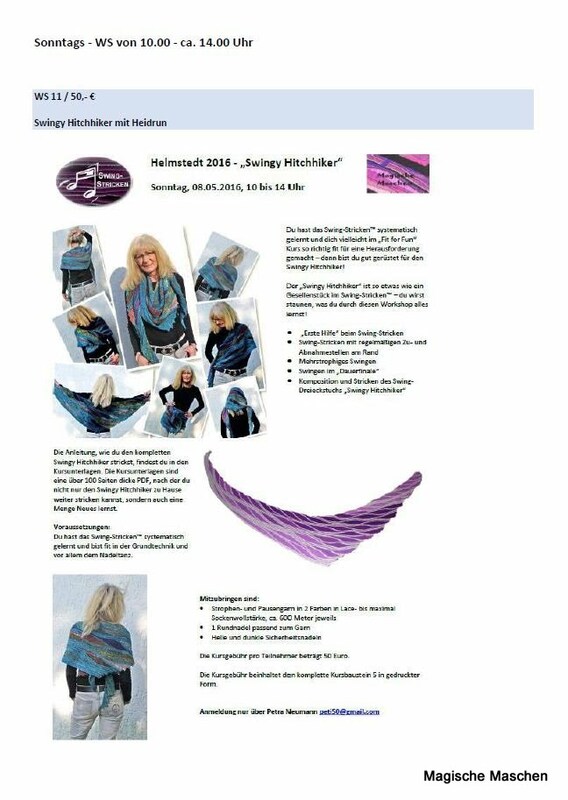 Here it is – the Lismeverruckt shawl I designed for Swiss Wulle Festival, now available as a pattern! 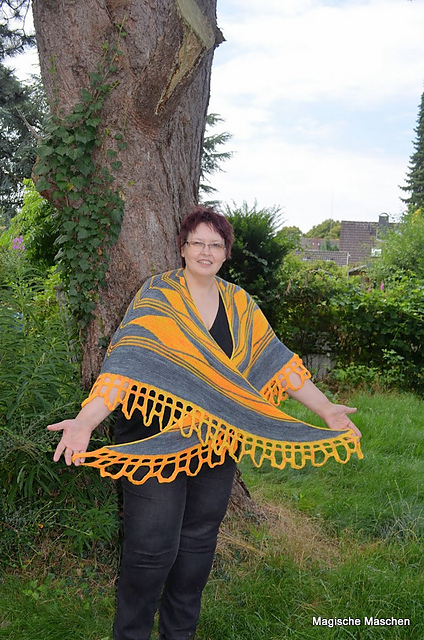 Lismeverruckt is a curved shawl that is worked in three different knitting directions. 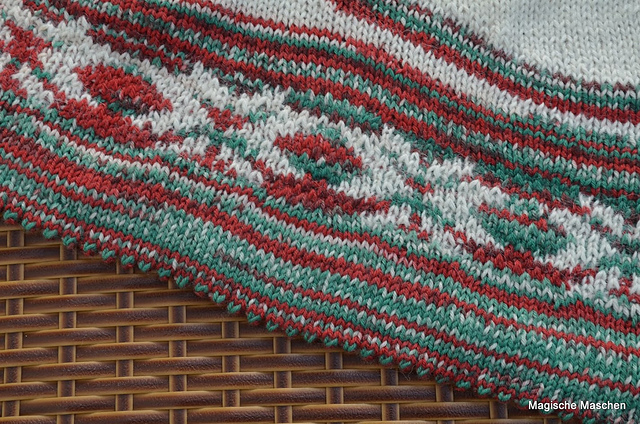 The main pattern is written row by row and as a photo tutorial. It applies a lot of Swing-Knitting techniques without explaining them. Easy to knit for everyone without prior knowledge of the technique! 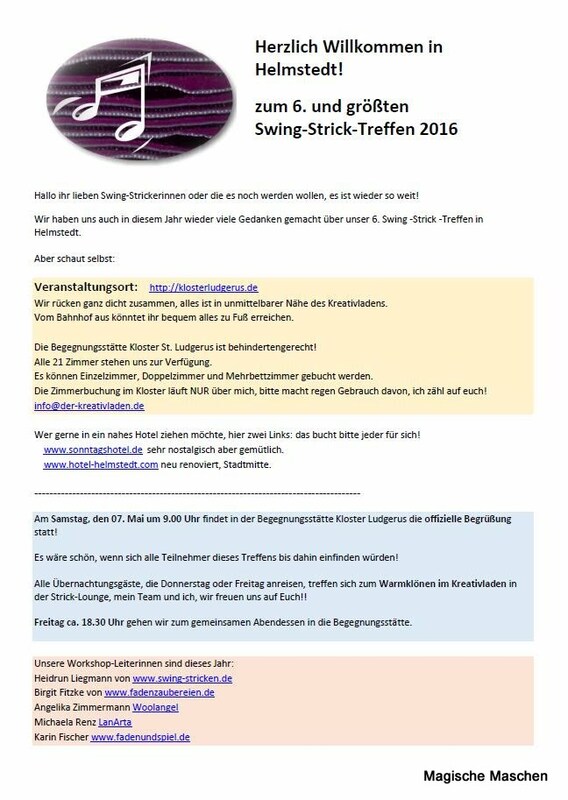 There is a second version for people who have already learned a bit of Swing-Knitting by doing the Swing-Knitting Taster Class in a live workshop. 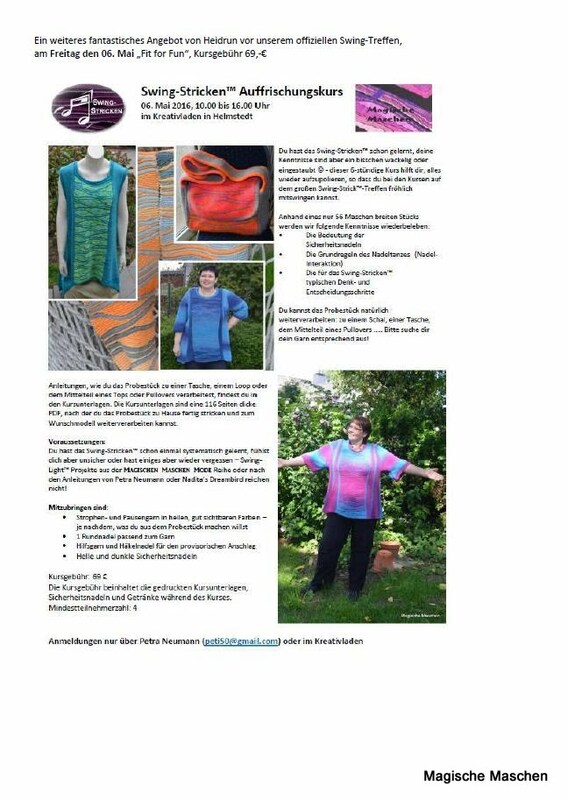 The pattern is an addition to the Taster Class and does not include the Taster Class itself! 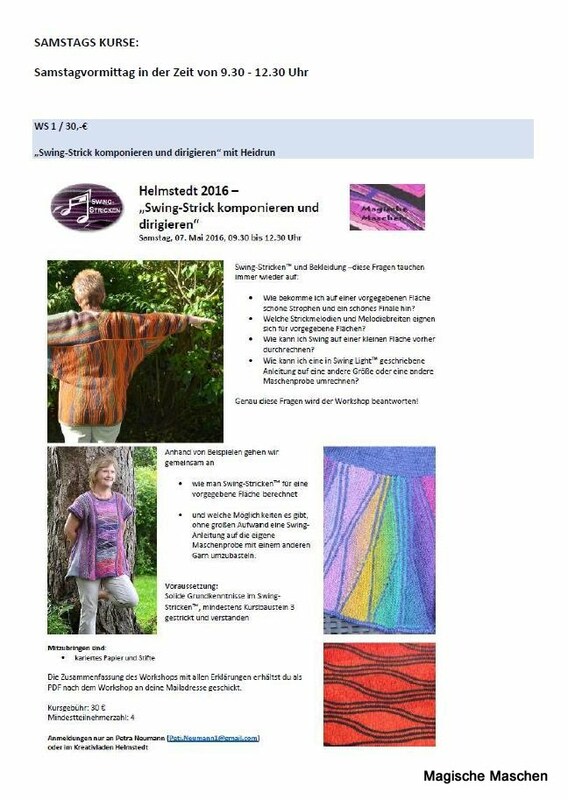 All knitting techniques that might not be known by everyone, are explained step by step as photo tutorials in a technical appendix to both versions of the pattern. Thank you to Angelika and Sascha for modeling! 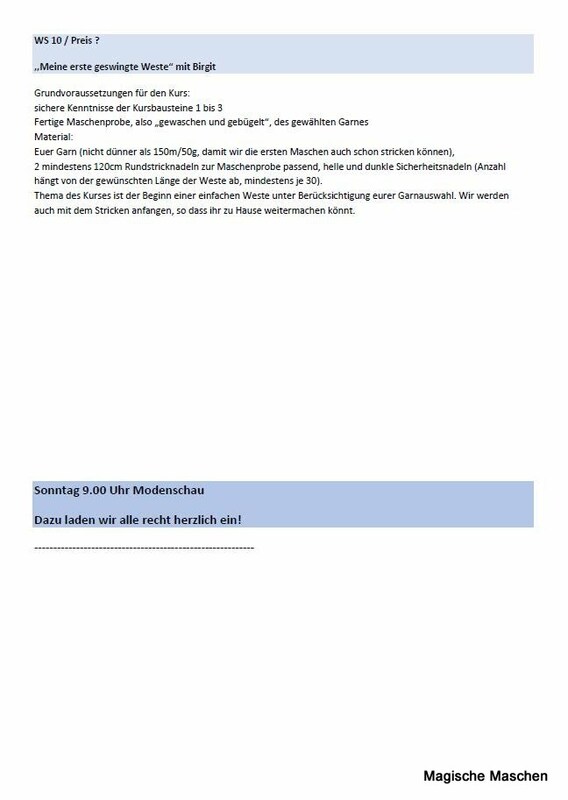 Our English speaking guests all understand and speak German very well, so I saved a lot of time and did not translate the complete program – if you don’t understand the German text and need a translation, please send me an e-mail to Heidrun@magischemaschen.de ! The class descriptions that are still missing I will add as soon as I have got them – then the program PDF will be updated as well! 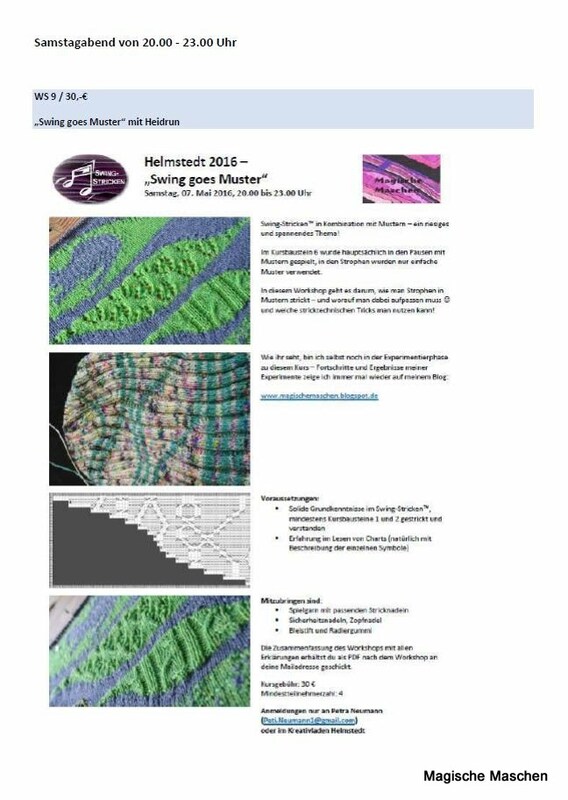 When you look at the “pages” in the right menue, you can find the Helmstedt program there as well! 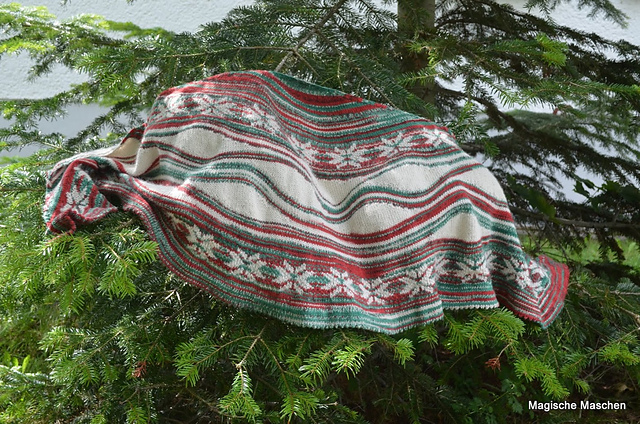 When I was at Wollgarnspinnerei Ferner in Austria in August 2015, this yarn jumped at me – Lungauer Sockenwolle 6ply in a special Christmas color edition! 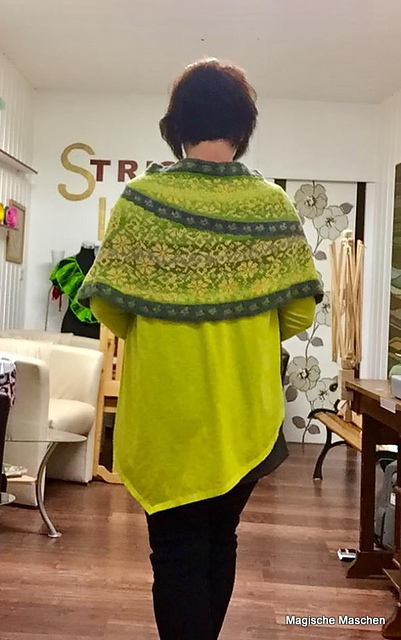 The idea for this shawl was there at once. 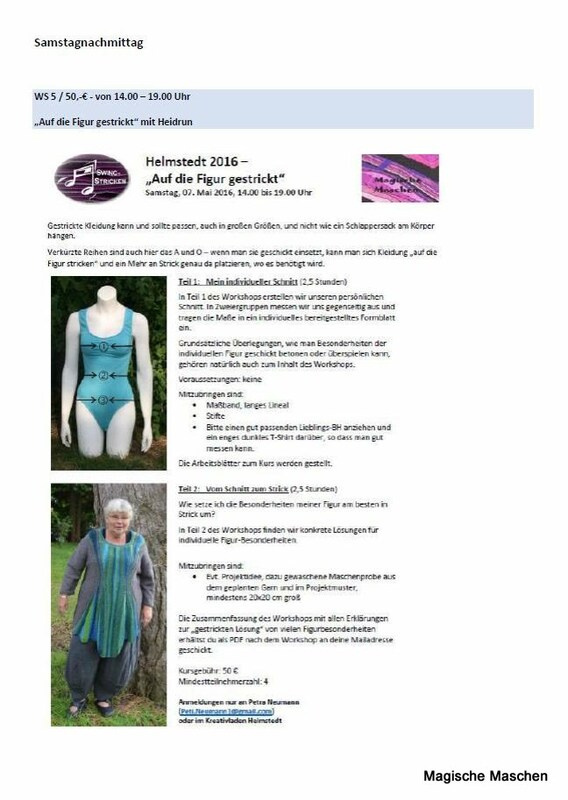 Now I finally managed to write the very detailed pattern as well – it is online in German and English. 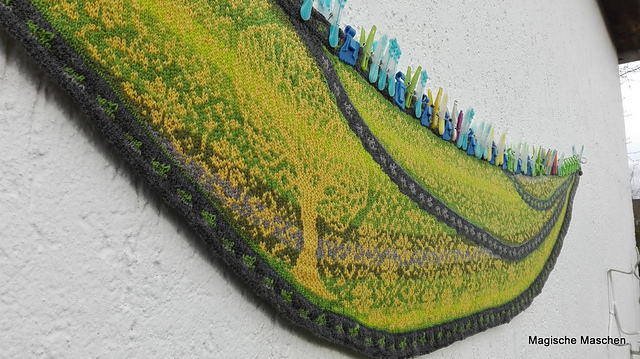 Snowy Hills is a crescent shaped shawl that is knitted top down.It is approx.. 180 cm wide and 65 cm deep in the middle part. The shawl is knitted in stockinette stitch. It is composed of 6 parts, all parts are explained in detail. 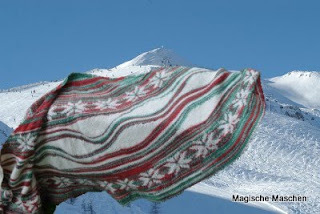 You need basic knowledge of Fair Isle knitting to knit Snowy Hills. All elements of general knitting technique that might not be known by everyone, are explained in detail with step photos . 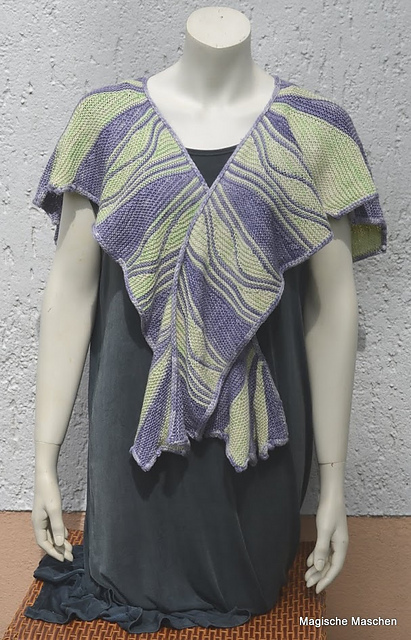 The shawl involves elements of Swing-Knitting™, but the short row elements are also explained row by row so that an advanced beginner will be able to knit it without prior Swing-Knitting™ knowledge. There are additional short explanations for Swing-Knitters as well, written in a colored box. 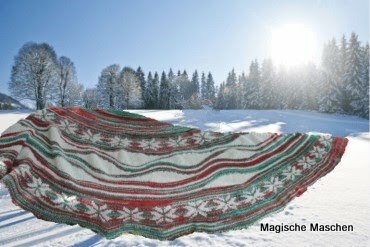 Snowy Hills is made of a special edition of Lungauer Sockenwolle 6ply of Wollgarnspinnerei Ferner combined with Ferner Alpaca. Contrasting yarn: 3 x 50 g Ferner Alpaca (100% alpaca, 100m/ 50g), color 101 offwhite, I needed approx. 330 meters. yarns, please take care – the contrasting yarn has to be a bit thicker than the main yarn! 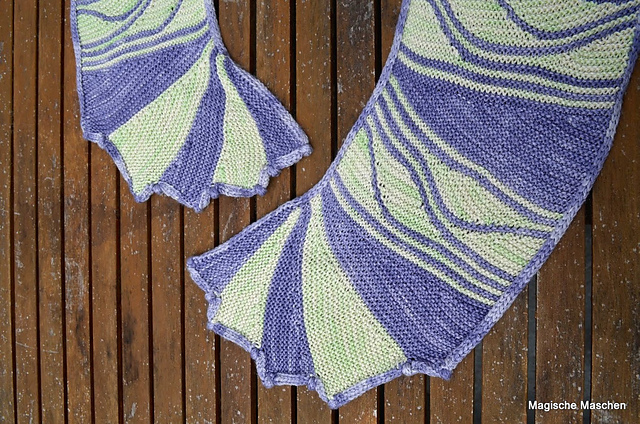 You will need to use a slightly thicker yarn for the short row elements of the swing-knitted border, if you want the shawl to keep the crescent shape without bulging and contracting. 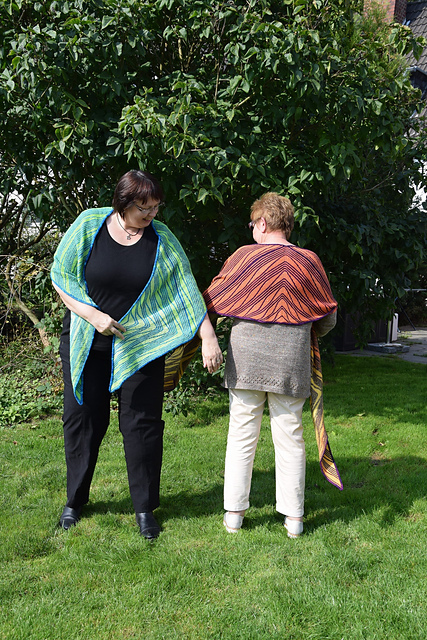 If the yarns you use are thinner than the yarns I chose, the shawl will become smaller than mine. 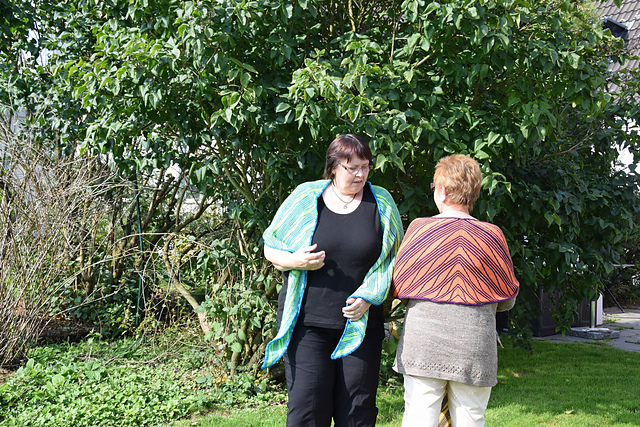 If the yarns you use a thicker than the yarns I chose, the finished shawl will become larger than mine. Thank you to Karin for modeling!